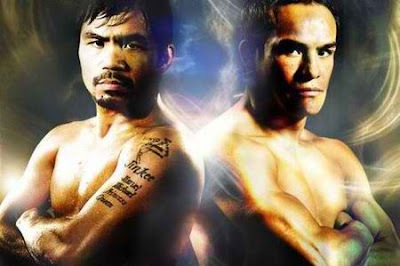 The excitement is increasing exponentially as the most awaited day of Pacquiao vs Marques fight gets nearer and nearer. The Filipinos, Mexicans and all the boxing fans around the world are all prepared to see how Manny Pacquiao and Juan Miguel Marquez will slug it all out this Saturday, November 12 at Las Vegas. This Pacquiao vs Marques fight is now the third encounter between “Pacman” and “Dinamita.” Many people are hoping that this third fight will reveal the true winner once and for all. The first two fights is somewhat “inconclusive” for some boxing fans and some say that Marques actually defeated Pacquiao. The first Pacquiao vs Marques fight in 2004 ended into a draw. The second fight in 2008 ended by split decision in favor of Manny Pacquiao. Juan Marques had been yapping ever since the second fight and he keep on claiming that he is the true winner. Pacquiao’s coach, Freddie Roach, is irritated with Marques and hope that the Filipino boxers will emerge victorious by knocking Marques out. Roach believes that knock-out victory is necessary to remove the doubts about Pacquiao’s victory. So, who will emerge victorious in the third Pacquiao vs Marques fight? Opinions vary but majority of boxing fans, sports writers and boxing analysts are saying that Manny Pacquiao will win. The number of celebrities visiting Manny Pacquiao shows that opinion is in favor of a Pacquiao victory. I, for one, is hoping for Manny Pacquiao to win against Marques. But the truth is we can never be sure until the third Pacquiao vs Marques fight is over and see by our own eyes who is the last person standing. Watch the Pacquiao vs Marques fight and let us see Las Vegas shake with their heavy punches. The fight is this Saturday (November 12 at 9 PM ET). They will be fighting in Welterweight Division for 12 rounds. Visit Before the Eastern Sunset and read about my first random notes.